Sound is measured in units called decibels (dB). Sounds of less than 75 decibels, even after a lengthy exposure, are unlikely to cause hearing loss. However extended or repeated exposure to sounds at or above 85 decibels (approximately the level of a vacuum cleaner) can cause hearing loss. The table below, the graphic and the poster to the side give examples of various everyday sounds and their typical loudness levels in decibels. The table shows the length of time we can safely be exposed to these sounds before permanent damage is likely to occur. 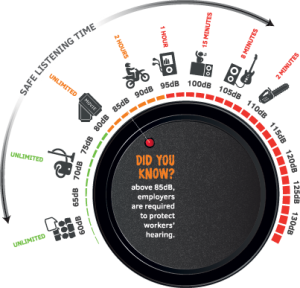 Most governments regulate noise exposure for safety reasons and the most commonly used maximum acceptable noise exposure level is 85 decibels over eight hours (a typical working day). Want to know more about loud sounds? How loud is too loud? Find out from the noise simulator here. For a more in-depth look at loud sounds, visit the NOISE database which brings together hundreds of noise measurements from around the world. There are many other useful hearing loss infographics worth having a look at, to keep it current – it might best to ask Google. Loud sound does not have to be physically painful to cause hearing damage. If you are in a situation where you need to raise your voice to be understood, then the noise is probably too loud. If you need to shout at a person only one metre away to be heard, then damaging noise is occurring in your immediate environment. If you are listening to your personal stereo player through headphones and you can’t hear traffic sounds or people talking nearby, then your headphone volume levels are damaging your ears.